Are you currently stuck in a goal? Do you feel like nothing is moving even though you’ve been spending days and weeks on this task? If so, welcome to development hell. 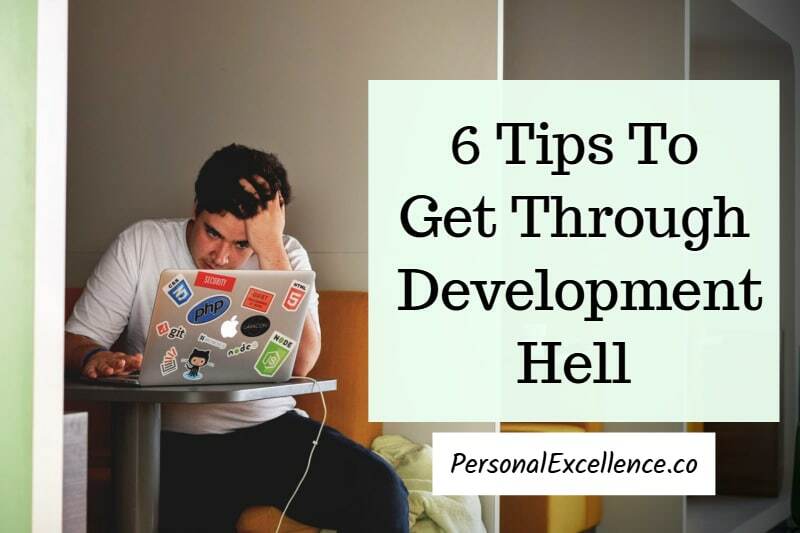 As a creator and a writer, there have been times when I’m stuck in development hell, be it when I’m writing a new book or working on a new project. Being stuck can be very demoralizing as nothing seems to move no matter what you do. Here are my 6 tips to get through this difficult period! 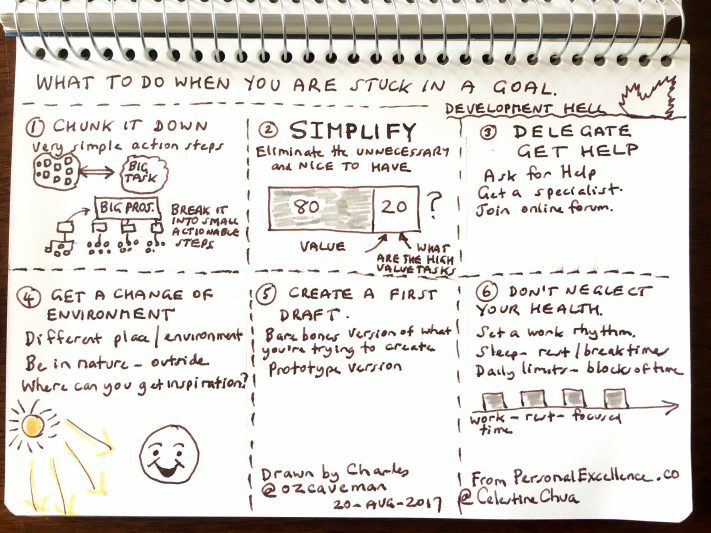 It’s easy to feel intimidated by a project when it’s a very abstract, like “write a book” or “draw a comic.” Chunk down the task such that it becomes a series of simple action steps. After all, our goals are the sum of hundreds of action steps, strung together to create the final outcome. When you dream, think of your vision; but when you execute, think of the tiny baby steps that make up your goal. So for example, if you are working on a presentation, break it down into little steps. Maybe your presentation has 4 sections, and each section has 3 sub-sections. Create a simple outline of what to do, then work on Section 1.1 first. Focus on Section 1.1 and only Section 1.1. Don’t worry about the other parts. If you find the task too intimidating still, break it down further. Keep breaking it down until you don’t feel intimidated by the task anymore. Then, focus on the immediate step, and don’t worry about the other tasks until the immediate step is completed. When you do this, you’ll wonder why you took so long to get started because everything seems so easy! Are you a perfectionist? As a perfectionist I have a habit of overcomplicating my tasks. After working on countless projects, I’ve learned that when you increase the number of variables in a goal by 2X, you don’t just increase the complexity of the project by 2X — you increase it by an exponential factor. Instead of doing every single thing, keep only the things that serve a role and add value to the project. For example, when I was working on the website redesign last year, I realized that many elements of the old layout required frequent maintenance. Also, every time I introduce a new feature to the site, something else will always break later on, because so many things on the web are interdependent nowadays. I decided to make things simple — create a layout that’s easy to read, and cut out anything non-essential. I eliminated the sidebar, switched to a very minimalistic look, switched from WordPress multi-site to the standard site installation, removed all popups, and removed other “nice to have” but draining elements. I also removed the blog comments and forums which were taking up a lot of my time while adding little value to other PE readers (99.99% of readers do not read the comments or use the forums). After a week, I completed the new layout. This simplification means that I now spend much less time maintaining the site each month. As much as possible, simplify. Use the 80/20 rule to help you. What are the 20% key tasks that make the biggest difference in your goal? Focus on them. Cut down as much of the unimportant stuff as you can. The more you cut down, the more time you have for the most important parts of your goal, the greater your output. Often times we think that we need to do everything alone. You don’t have to. Unless this is a goal that you 100% need to do by yourself, try and see if you can delegate or ask for help, especially for the parts you are stuck with. For example, online businesses have become incredibly complex in the last few years. While it was possible for me to do everything alone in the past, there are too many moving parts today for me to take care of them alone. After being stuck in development hell for many of my business plans, I realized that I needed to outsource parts of my business to specialized providers, even if I need to pay more. From using specialized shopping cart services to upgrading to a better host to using a third-party course management solution, doing these has freed up significant amounts of my time and worry. Instead of spending countless nights fixing problems, I can now get back to what matters — helping others grow and solve their problems. In fact, I wish I had sought for help right from the start! If there’s something you are not sure about, ask for help. Consult experts who have achieved the results that you want. Get advice from people with experience in this. Hire someone to help you. Even if you don’t know anyone, there’s really no excuse — there are many free Facebook groups today on all topics imaginable — business, book writing, video creation, training — and many users are helpful in giving advice. Simply search a topic, look for the groups that fit you, and click “Join.” I have learned a lot from just reading people’s comments in Facebook groups. Don’t feel like you need to do this alone, because you are not alone. There are many people willing to help, if you would just let them. Sometimes if you’ve been stuck for a while, maybe it’s the environment stifling you. Getting a change in environment, talking to different people, and hanging out in different social groups can give you different inspiration. As a writer, the environment greatly affects me and my writing. I’ve learned, through trial and error, that being in nature greatly fuels my writing, while being in a stifling environment restricts my thoughts and flow. I know that when I’m stuck writing and rewriting the same thing, it usually means that I need a change in environment, and doing the same thing (trying to push through with my writing despite my lack of inspiration) is just a waste of time. Similarly, if you are working on a creative project — a drawing, a comic, a book, a course training, web design — get a change of space. Find ways to feel positively inspired. Try a different routine, visit different places, and hang out in a different environment. Do this until you find a space that helps you create quickly and easily, then recreate this in your work/home environment as much as you can. If you’re suffering from writer’s block, check out my podcast on How to Overcome Writer’s Block. If you’re stuck with too many considerations, create a first draft version first. A first draft is a bare bones version of what you’re trying to create — stripped to the bare essentials. Instead of trying to create a perfect output the first time round which is impossible, aim for a lousy, crappy version. The way I launched my blog from the start was I simply wrote and posted articles that I felt would change people’s lives. I planned what I was going to write and reviewed my posts before posting anything, but I didn’t spend weeks or months perfecting my work beforehand. When I look back, I cringe at some of my past articles, which is partly why I’ve been revising my old articles in the past 1-2 years. But it’s precisely from allowing myself to post imperfect pieces of work that I could grow and build PE to where it is today. If I kept obsessing over that perfect first article or first 10 articles, I don’t think I would have launched my blog even today. Let go of the details, and just aim to get a first draft out first. If you’re developing a software, work on a simple prototype first. If you’re writing a book, write the simplest manuscript you can. You can always add the details in the second, third, and fourth iterations. Last but not least, don’t neglect your health. Maintain a healthy work rhythm, where you have a list of things you don’t compromise on such as your sleep, rest/break times, and meal times. Don’t skip your meals, shower, and sleep even if you feel like it. Don’t work until you feel exhausted — rather, set a clear cutoff, like stopping work at 8pm or 2 hours before you sleep. This is important because you are the heart and hardware of your project. When you neglect the heart and hardware, you compromise on your project output. While you may feel that you are spending less time on work since you are taking time out for rest and all, after a few weeks you will see that your output starts to change from short-term to long-term focused, and you start to work smarter because you have the mind space to do so. Why? That’s because work tends to expand to fill the time available for completion (Parkinson’s Law). Allocating an infinite timeline often decreases per hour productivity rather than help you get more done. On the other hand, there are key areas of life — self, rest, relationships — that, when neglected, drains the human psyche. The proverbial Silicon Valley story that you must plunge your whole life into work, at the expense of self/rest/relationships and to overcome all odds, is overrated. You gain way more in the long run by honoring your personal needs, which interestingly ripples back and increases your output by 10X. New Release of Be a Better Me in 30 Days Program! After months of hard work, I’ve finally launched the upgraded version of Be a Better Me in 30 Days Program, my 30-day character transformation program! The material has been hugely upgraded, with the guidebook expanding from 230 pages to 308 pages, over 100 participant verbatims added in, workbook updated, and many parts heavily rewritten. If you haven’t gotten the program, read about 30BBM here, read the FAQs, or head straight to checkout. For recent customers (2016 to July 2017), I’ve sent out the email on how to get the upgraded version of 30BBM on Aug 1. Check your mailbox for the email titled: “New Release: Be a Better Me in 30 Days Program.” If it’s not in your inbox, please check your spam folder. For past 30DLBL/30BBM buyers (pre-2016), you can upgrade your 30DLBL/30BBM upgrade for a small upgrade fee, as detailed in my Aug 1 email. I’ve extended the upgrade window to 30 August. Both programs have been hugely improved with improved writing, and an addition of over 140 pages and 200 hand-picked verbatims/user results. Please upgrade before then as upgrade requests will not be handled after 30 August! Thank you to everyone who has purchased the upgraded 30BBM — enjoy the program and your character transformation journey! 🙂 Any questions on 30BBM, let me know here!